The May 2013 issue of NSS News is on its way and will soon be arriving in mailboxes. 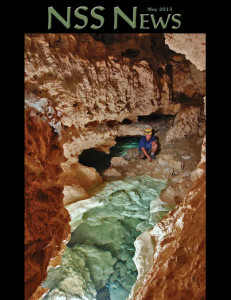 This upcoming issue features an in-depth article, written by Derek Bristol and John Lyles, on last year’s discovery of Oz in Lechuguilla Cave. Meanwhile, Amy Hinkle shares her trip report on the 2012 VBATS Expedition to Mexico, and Gary K. Soule presents a unique tribute to ex-commercial show caves. Additionally, Bill Varnedoe gives a mini history of a few things he saw and experienced during the formative years of caving and Ralph Bucca contributes an excellent short story entited, $$$ Pit. Finally, Kim Metzgar writes about the all that there is to see and do around Shippensburg, Pennsylvania during this summer’s NSS Convention, and the NSS President, Wm Shrewsbury, gives an update on the headquarters renovations. NSS Members, start watching your mailboxes. The NSS News is the monthly publication of the National Speleological Society. It is sent to all regular (but not Basic) members of the NSS. If you’re interested in receiving copies, visit caves.org and become an NSS member today. For individual issues, visit the NSS Bookstore.